When it comes to African fashion the two major things that stand out are clothes and hair styles. African inspired hair styles such as Braids, locks, Weaves and Twists are just as captivating as the prints themselves. ChrisKes Salon has found this correlation between African fashion and hair styles and has come up with the perfect combo package. Since clothes compliment hair styles why not have those both made together? At this beautiful afro centric salon the perfect outfit can be made to match an alluring hair style for any event. Our excellent fashion designers work along with our experienced stylists to create clothes that compliment the very hair style the client wants. With so many beautiful African fabrics to choose from and our creative designer carefully considering the client’s specifications, this is a dream offer! For special occasions it’s always refreshing to see bold attire with an equally bold hair style that compliments the theme of the clothing. This makes for a unique flawless Afro chic fashion experience. ChrisKes salon offers this experience at very affordable prices and the best part is that the client’s specifications are always top priority. We source the very best Afro Fashion. Don’t go anywhere else to get your authentic, ethically-sourced African fashion prints! We build our reputation on providing a quality work to our customers. We master the most comfortable environment to make your visit the most exciting experience. We pledge to provide you with fast friendly, Affordable and Quality Service. Our work will speak for itself. Bring your Electronic Devices to connect to our Free Wi-Fi hotspot. If you have any question just call or email us anytime. With our team of well trained and experience professionals African hair braiding stylist. We give you perfect braids or weaves for your personal Style, make you feel your best day after day. For men ChrisKes is having one of the best Barbers in town to give you the best individual Cut ever. We work hard to ensure that you are met with the highest quality customer service as soon as you walk through our door. Great shopping experience by ChrisKes. 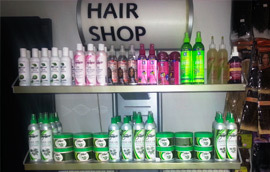 Our Store provides you with almost all your needs for your Beauty. Prices may vary depending on the level of service provided and product used. Hair consultations are free of charge. We encourage all of our guests to solicit a price from our designers before having a service performed. It is our goal that you feel comfortable with pricing so that we can provide a relaxing and enjoyable experience for you!